Above, Robert “Mac” McAlister stands inside the S.C. Maritime Musuem in front of the Fresnel bulb that lit the Georgetown Lighthouse for a century. The history of North Island, the home of the Georgetown Lighthouse, the oldest operating lighthouse in the state, may surprise people. It was first inhabited by Native Americans, then served as a bustling seaside resort for rice plantation owners, and now it is a barren, protected nature preserve. A new book by Robert “Mac” McAlister of Georgetown, titled “Georgetown’s North Island: A History,” follows the island from its earliest inhabitants through the Revolutionary War, the Civil War and two hurricanes that wiped out houses and buildings there. 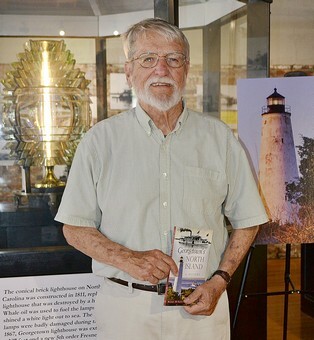 The book will be available after May 11 at the S.C. Maritime Museum and Waterfront Books, both on Front Street in Georgetown, and Litchfield Books in Pawleys Island. Books can be ordered online at www.historypress.net. A book launching at Waterfront Books will be held on Saturday, May 23, from 11:30 a.m. to 2:30 p.m. McAlister will sign books and answer questions about North Island. Other events are in the planning stages, McAlister said. Some of the most interesting history of North Island involves the notable people who have visited or lived on the island, McAlister said. They include Gilbert du Motier de Lafayette, France’s hero of the American Revolution, rice planter Benjamin Huger, Gen. Peter Horry and Yawkey, the former owner of the Boston Red Sox. Phil Wilkinson, Yawkey’s superintendent for 15 years on North Island, wrote the forward and was instrumental in providing information and modern photographs for the book, McAlister said. “He knows more about North Island than any living person,” McAlister said. McAlister said an important aspect of North Island today is the research being done by the North Island/Winyah Bay National Estuarine Research Reserve, operated by the University of South Carolina. “The research being done by USC is important and helpful to the environment,” McAlister said. NI/WB NERR protects more than 18,916 acres of habitats ranging from tidal and transitional marshes to oyster reefs, beaches, and inter-tidal flats and from coastal island forests to open waterways, according to the NERR website www.nerrs.noaa.gov. With more than 90 percent of North Inlet estuary’s watershed in its natural forested state, its relatively pristine salt marshes and ocean-dominated tidal creeks have higher water and habitat quality than those in adjacent Winyah Bay. The reserve is home to many threatened and endangered species, including sea turtles, sturgeons, least terns and wood storks, the website states. Established by the Coastal Zone Management Act of 1972, as amended, the reserve system is a partnership program between the National Oceanic and Atmospheric Administration and the coastal states. NOAA provides funding, national guidance and technical assistance, the website states. Each reserve is managed on daily basis by a lead state agency or university, with input from local partners. McAlister is a retired construction engineer and manager. He and his wife, Mary, have lived in or near Georgetown for much of the past 60 years and they participate in the activities of the S.C. Maritime Museum in Georgetown.